You can spot the Sports app tile on the Start screen by the winner’s cup icon. This app is a one stop shop that can help you stay current will all your favorite teams. 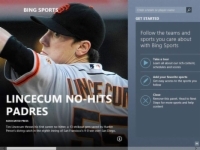 1Clicking this displays Bing Sports, which includes a tool for tracking your favorite sports, top sports stories, a list of headlines, favorite sports, and a constantly updated scoreboard. In addition, there are videos and slide shows for your sporting pleasure. 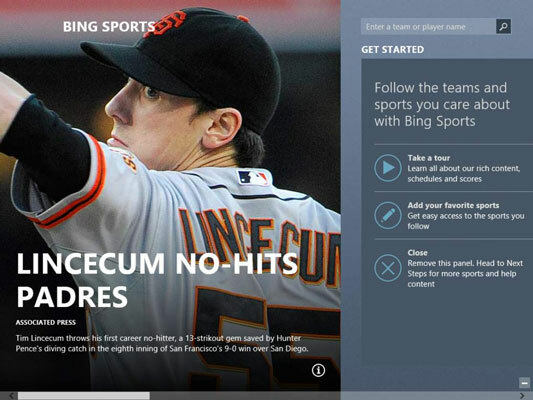 2Click the Sports app tile on the Start screen. A top story appears with Get Started tools to the right. 3Right-click anywhere on the screen to display a set of tools for various sports associations such as the NFL and NBA. Click the arrow next to one of these to display a list of options including schedule, leading players, and standings. 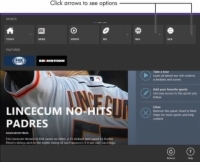 4Click the screen again and then use the horizontal scroll bar to view categories of information such as the scoreboard, top stories, headlines, and more. 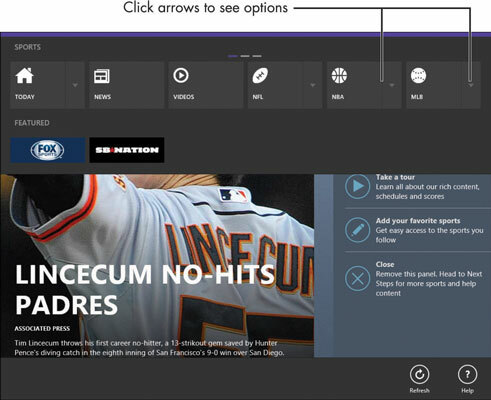 To add a sport to your Favorites, scroll to the right to display the Get Started section, click the Add Your Favorite Sports tool, or scroll to the right to the Favorite Teams section and click the button with a + symbol, enter your team’s name, and click Add.